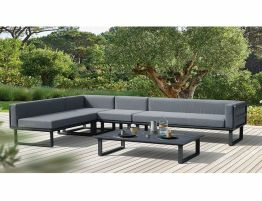 The Vivara outdoor sofa is a refined collection with clean lines.‎ It has the capacity to create ambiance and invite an enjoyment of life. 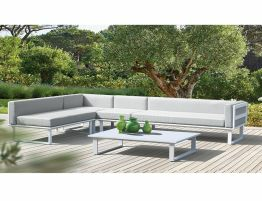 Frame in powder coated aluminium.‎ Cushions in luxurious padded 100% recyclable polyolefin.‎ The Vivara collection has a minimalistic sophisticated design that is more importantly comfortable and relaxing. 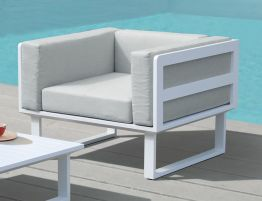 The Vivara outdoor furniture collection seeks to develop the tradition of outdoor furniture, linking with the Mediterranean architecture and way of inhabiting.‎ An innovated tradition, made with a construction and elegance that fits the modern lifestyle. 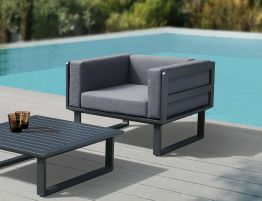 Aluminium: A light and tough metal with an excellent strength to weight ratio and corrosion resistance - making it an ideal material for outdoor furniture. Our aluminium is enhanced by pre-treating the aluminium extrusions with a chrome conversion coating. The treated frame is subsequently coated with aan electro-statically applied, powder coat finish. The resulting finish is knock and scratch resistant, impervious to moisture, highly resistant to corrosion and easy to clean.